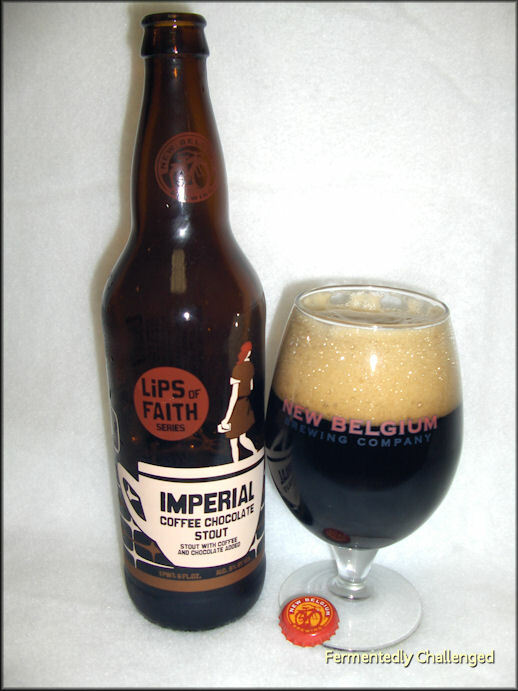 Whenever a Lips of Faith beer is bottled at New Belgium you know you're in for something slightly off the norm, but always flavorful. This time, New Belgium took a classic imperial stout recipe and added coffee and chocolate to get New Belgium Imperial Coffee Chocolate Stout, a brew that weighs in at 9% ABV and sold in a 22oz bomber bottle. Call me a sucker for coffee beers. I ended up buying two bottles of this beer right off the bat. I may not be a coffee drinker, but coffee beer is the only way I'll drink it. 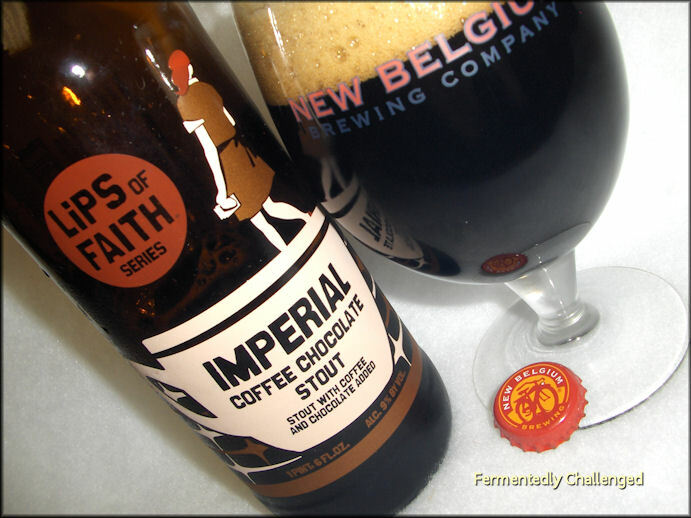 New Belgium upped the ante by adding in chocolate to smooth things out. Coffee beers are either a hit or miss. Put in too much coffee and a beer ends up too bitter and roasty. I've tasted recipes that had too much or not enough in the past. I'm always willing to give any coffee brew a try at least once. And in this case, an extra bottle was purchased just in case I fell in love with it. Appearance: New Belgium's Imperial Coffee Chocolate Stout (ICCS) poured black as a black cup of coffee, only this brew built up an incredible multi-finger tall brown frothy head that seemed to last for 10 or more minutes and left a clingy lacing around the glass. On the sides of the glass was just a slight brown tone, but otherwise I couldn't see through the beer. The bottle had a good "hiss" when opened and seemed to have a modest level of carbonation. Aroma: I chose to use a New Belgium globe glass for his beer as this type of glass worked great to help capture all of the aromas of a beer. I let the beer sit out for about 15 minutes to let the stout warm up a bit from the cold fridge temperature. Once warmed slightly, all of the aromas started coming out. Instantly, I made out a big nose full of roasted coffee with a hint of sweet chocolate in the back. The coffee gave off a very pleasant and inviting aroma and the chocolate gave a promise of a balanced dry sweetness. There was also a slight trace of earthy hops and roasted malt in the background, but otherwise, the coffee aroma took center stage. Taste: The ICCS was full bodied. Nothing light about this brew. It had a rich, creamy feel and was chewy on the back end. The first taste was of bitter coffee with a dry roasty malt background. Admittedly, the hop flavor and bitterness also snuck in up front. This beer was one to quickly coat the tongue and a lingering flavor of coffee remained well after the sip. There was a small taste of chocolate in this beer, but it wasn't the sweet kind, rather more like baking chocolate - unsweetened and slightly bitter. I was expecting a bit more sweetness out of this stout than what I found there. What I did like was the fact that this beer warmed me up on the inside rather quickly. I got a warming glow almost after the first 4-5 sips. This was definitely a big coffee-lovers beer. As the beer warmed I could start picking up a bit more chocolate, but it needed a bit more. This beer may even work well as a breakfast beer, although I would recommend pairing this beer with a sweet cinnamon roll, some M&M's or a dish that has a bit of sweetness to it. I got a bit creative with the second glass from this bomber. I added a handful of mini-marshmallows to the glass. Perfect! It added a touch of sweetness and worked well. Try it sometime. Overall: As a sipping beer by itself, New Belgium's ICCS was strong, bitter and dry. It begged to be paired with something sweet and for my next sampling that is exactly what I intend to do. 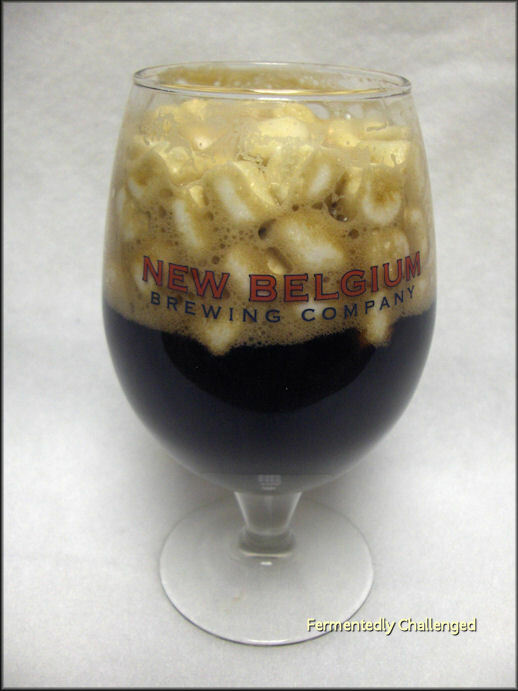 In addition to the marshmallows, I paired this beer with a small peanut butter and chocolate candy - the extra sweetness went well with the bitter coffee flavor. It definitely pays to pair this beer with a sweet dessert. This beer takes a little while to get used to, but once you do it'll be just fine. It's a big beer that'll warm your heart and the coffee lover in you will enjoy it. Please do pair this beer with a sweet dessert or tangy food dish and you'll be even more impressed. - New Belgium embraces sour notes with latest releases.